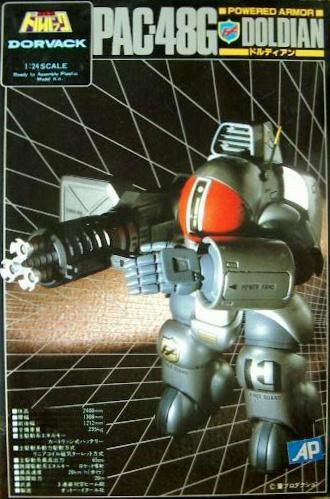 (Sorry, out of stock...SOLD for $45.00) Vintage Dorvack "Aroma Harbla" Powered Armor Kit, by Gunze Sangyo. Another fantastic imported 1/72 scale model kit by Gunze Sangyo from the Japanese Sci-Fi anime TV series "Dorvack". This Alien "Powered Armor" is the endearing "Aroma Harbla", of the evil invading Idelians (why "Aroma Harbla"? Did he have "smell issues"? Perhaps a little bodily hygiene was in order? Mr. Pop Top lays awake each night pondering such matters.) "Special Armored Battalion Dorvack" ran for 36 episodes in 1983 on Japanese TV, and is best known for being the spawning ground for some of the characters that were later repackaged in the US as the first "Transformers"...the ones known as "Roadbuster" and "Whirl" came from this series. The plot concerned an invasion of Earth in 1999 and the Power-Suit Dorvack Battalion's brave battle against the Idelians, with a lot of the action taking place in the Alps!! The men fought in powered "suits" which were part battle-robot, part tank...and some could transform into other vehicular forms. This MINT-IN-BOX, unassembled plastic model kit from 25 years ago is another great find from The Pop Top Shop...don't miss out. Model box size 8" x 5 1/2". Out of stock.